Royal Jelly…Often known as bee’s milk, Royal Jelly is a concentrated super food responsible for turning an ordinary worker bee into a Queen Bee. Fifty percent larger than worker bees, she lives four to five years, compared to other bees that only live one season. A thick creamy colored liquid, Royal Jelly contains vitamins A, C, D & E, as well as nine B-complex vitamins (B1-thiamine, B2-riboflavin, B3-niacin, B5-pantothenic acid, B6-pyridoxine, biotin, folic acid, inositol and cyanocobalamin). It also contains 22 amino acids, phosphorus, potassium, silicon and sulphur. Royal Jelly (along with Bee Pollen, Propolis and honey) contains a natural source of nutrients which the body needs to be healthy. Bee Pollen…consists of blended pollen grains collected from honey bees from a wide variety of plants. It is a very concentrated source of nutrients. 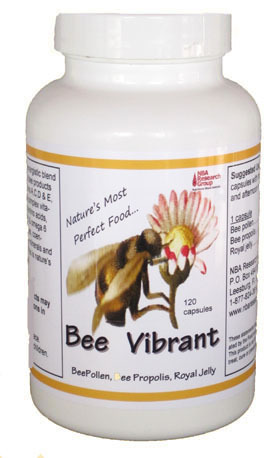 Bee Pollen contains every vitamin known. It contains 40% protein with a complete spectrum of amino acids. Over 25 trace elements account for 3.8% of Pollen’s weight, including every essential element. Nearly 10% of Pollen is omega-3 and omega-6 fatty acids. Pollen contains many active enzymes and coenzymes. The exact profile of Bee Pollen is variable, depending on the plant sources and growing conditions. Beta-carotene, lycopene, beta-sitosterol, quercetin and rutin are always present in the analysis of Bee Pollen. The nutritive, detoxifying and healing properties of Bee Pollen have been appreciated for years. In today’s toxic environment, Bee Pollen provides the nutrients essential for strengthening our immune system. It also destroys harmful bacteria in the intestines, improves assimilation and elimination. Pollen helps flush out the impurities and toxins that pile up in the capillaries due to stress, medications, and the pollutions of today’s lifestyles. Propolis… is a resinous material gathered by bees from the leaf buds and back of trees, especially poplar, birch, and conifers. In the hive, bees mix Propolis with wax and use it for repair and construction in the hive, as well as insulation and protection. Propolis also contains small amounts of pollen. The bees use Propolis to protect the hive against bacteria or viral infection and dangerous toxins. Bee hives are a virtually sterile atmosphere due to Propolis. In raw form (hive scrapings), Propolis is approximately 50-80% resins, 30-50% wax,5-10% pollen, and 10% essentials oils. Propolis is a very sticky substance with a sharp, almost bitter taste with the aroma of honey or vanilla. Propolis is rich in vitamins, high in B-complex vitamins, and contains notable quantities of vitamins C, E, and vitamin A. It also contains minerals and trace elements such as calcium, magnesium, iron, zinc, silica, potassium, phosphorous, manganese, cobalt, and copper. Propolis is extremely high in bioflavonoid content. Flavanoids are well known plant compounds that have antioxidant, antibacterial, antifungal, antiviral, and anti-inflamatory properties. Other properties of Propolis include acting as a local anesthetic, reducing spasms, gastric ulcers and strengthening capillaries. Propolis can be used by humans internally or externally. NBA Research Group is prohibited by law from making any claims that our products are suitable or effective in treating, curing, or preventing any disease or condition. We do not make these types of medical claims on any product , nor do we guarantee that they will work for any disease or condition. Information stated on this website should not be considered as medical. Only a licensed medical doctor can legally offer medical advice in the United States.